Sheet pan meals are all the rage right now. I know everyone has their reasons why they love them, but for me its the easy clean up. One pan, lined with foil, no dishes! I LOVE A GOOD SHEET PAN MEAL! So to further my love for sheet pan meals I decided to put together one of my favorite take-out recipes, Sweet and Sour Chicken. To begin you will need to preheat the oven to 425 degrees. While the oven is preheating, take a moment to prep your vegetables and chicken. Oh! Before I forget! I like to place my baking sheet into the oven while it preheats. This helps to give the chicken and vegetables that seared, browned look you get with a stir fry. When the oven is preheated and the pan is hot, remove it from the oven and add a little extra virgin olive oil. Add the vegetables and chicken to the baking sheet. Drizzle a little more oil over the vegetables and chicken. Give everything a toss so it is coated in the oil and seasonings. Remember, the pan is HOT. Bake at 425 for 30 minutes, stirring every so often. 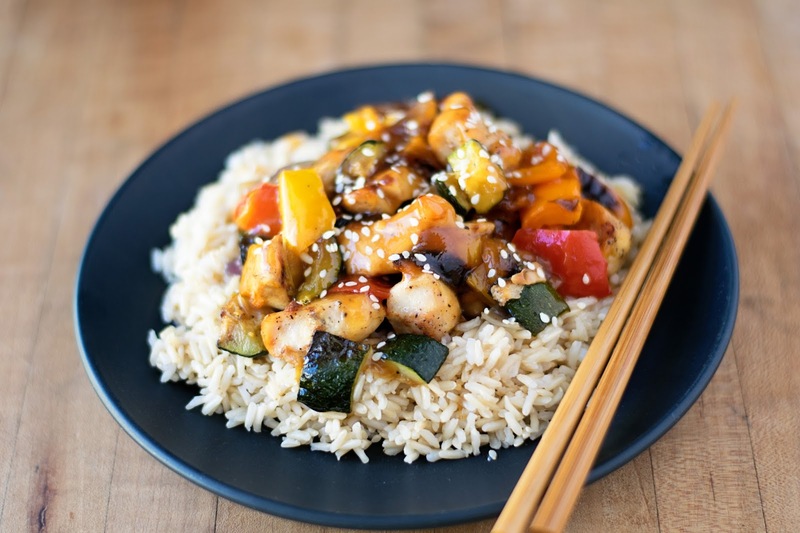 While the chicken and vegetables are cooking you can make your OWN sweet and sour sauce. Combine all of the sauce ingredients into a small sauce pan. Place over HIGH heat and bring to a boil. Let the sauce boil for 2-3 minutes until the sauce become clear, shiny, and thick. Remove the chicken and vegetables from the oven and give it one more toss. Doesn't think ALREADY look delicious! And there you have it! 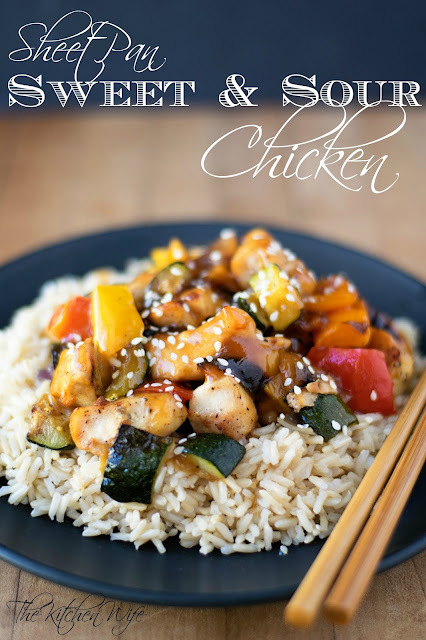 A flavorful, healthy, DELICIOUS meal of Sheet Pan Sweet and Sour Chicken Dinner Recipe! I like to place the chicken and veggies over a bed of brown rice and drizzle the sauce over it. However, you can totally toss the chicken and veggies in the sauce and eat as is or over noodles! Anyway you serve this EVERYONE is going to love it so get in the kitchen and make it TONIGHT!!! Place the baking sheet into the oven to heat as the oven comes to temperature. While the oven is preheating prep the vegetables and chicken. When the oven gets to 425, remove the sheet pan from the oven and drizzle the extra virgin olive oil. Place the sheet pan back into the oven and cook for 30 minutes, stirring occasionally. While the vegetables and chicken are cooking you will make the sweet and sour sauce. Add all the sauce ingredients into a sauce pan and whisk together until smooth. Place over HIGH heat and bring to a boil. Allow the sauce to cook until it is thick, shiny, and translucent. After 30 minutes, remove the chicken and vegetables from the oven, toss, and place over a bed of rice or noodles. Drizzle the desired amount of sweet and sour sauce over everything.